Brendan and Katie's kitchen is way too small to fit their needs, not to mention, Brendan's 6 foot, 5 inch frame barely fits into the space! Alison tackles their space planning dilemma by taking out a main wall between the kitchen and dining area and closing off the original doorway to create a wood framed pass through. Once the space is laid out properly, she brings in ceiling height light veneer cabinetry, large marble subway tile backsplash set behind open shelving, and gray quartz countertops to build the foundation of the kitchen. A wine bar, complete with chalkboard inset cabinet doors, is installed so that Katie can store and label her wine. To fit their stainless steel appliance dreams, Alison gives the homeowners a giant refrigerator, wine fridge, pull out microwave drawer, range and hood. Alison and the homeowners add a personal touch to the build with a copper DIY pot rack and cart to match the copper accents throughout the kitchen. A custom DIY dining bench table and copper bendable chairs give this couple the proper space to dine and entertain. Spruce up a shelf in your kitchen by installing a simple wine glass holder. 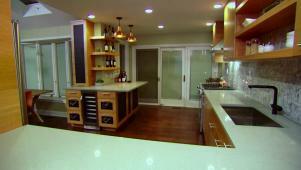 Opening up a cramped kitchen and adding copper accents top this remodel.